“Artisan” and “handcrafted” are words that get tossed around a lot these days, but at Jacob Bromwell they’ve been part of the company tradition for over 190 years. Jacob Bromwell was founded in 1819 with a mission to manufacture authentic campfire, kitchen, and fireplace products for “explorers, adventurers, homemakers, and traditionalists everywhere.” All Jacob Bromwell products continue to be made in the USA and are backed by a Lifetime Guarantee. 34th oldest continuously owned and operated company in the United States. Oldest manufacturer of tin and stainless steel products in the United States. Oldest housewares company in North America. Oldest manufacturer of campfire poppers and roasters in the world. Designs, manufacturing process, and materials remain unchanged since 1819. All products are non-electric and Made in the USA. Of course, back in the day there weren’t any bars for you to stop into while you were out on the trail, and you certainly didn’t carry a glass in your pack to enjoy your whiskey around the campfire. No, what you used was an all-purpose tin cup. 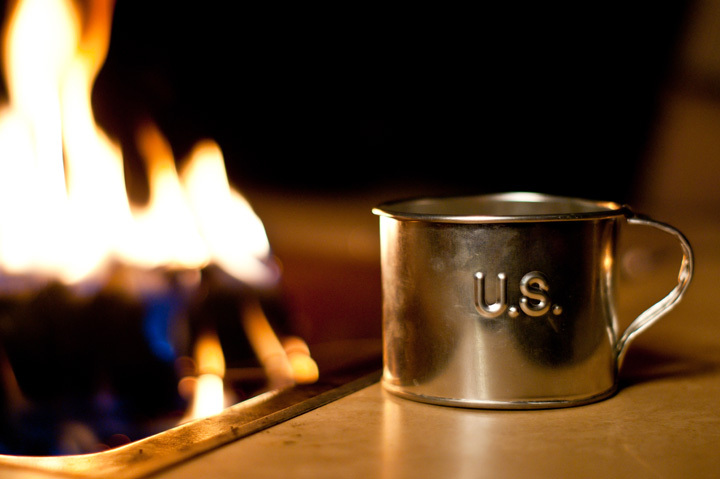 At Jacob Bromwell, the Classic Tin Cup ($25) is assembled by hand “with a little help from the original equipment.” Standard issue during the Civil War, the tin cup is a simple, pure way to enjoy your favorite whiskey, whether you’re camping in the mountains or reading a favorite book by a roaring fire. (remember books?) There are plenty of non-imbibing uses for the tin cup as well, just let your imagination flow. And now, you’ll have an opportunity to get into that pioneering spirit yourself, because the folks at Jacob Bromwell are giving away two Classic Tin Cups to Thirsty in LA readers! To enter the tin cup giveaway, all you have to do is “Like” the Jacob Bromwell Facebook page, then leave a comment in this post about how you’d use a Classic Tin Cup. Comments are closed at 12pm PST on Tuesday, July 19, 2011. Winners will be chosen at random and will be notified by email. Update Tuesday 7/19: The Classic Tin Cup giveaway has ended. For more information on Jacob Bromwell, visit www.jacobbromwell.com.